England shrugged off the absence of its best players to score five tries in a 27-13 win over fierce rival Wales at Twickenham on Sunday, boosting confidence among the Six Nations champions ahead of their upcoming tour to Australia. England came from 10-0 down after 14 minutes, with Luther Burrell and Anthony Watson crossing for tries in the first half and Ben Youngs, Jack Clifford and Marland Yarde going over after halftime. England coach Eddie Jones was without his Saracens contingent of Owen Farrell, Billy Vunipola and second-row duo Maro Itoje and George Kruis, who were absent because they played in the English Premiership final on Saturday. Flyhalf George Ford had a day to forget with the boot, missing six of his seven kicks, but England wasn't made to pay and kept intact coach Eddie Jones' unbeaten start to his tenure. 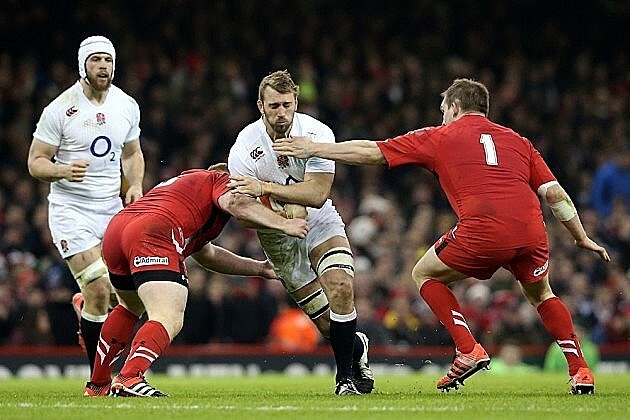 "We didn't get off to the best of starts but it was great to see everyone dig in," England lock Joe Launchbury said. "I think the second half we had a bit of control and that was where we got the win." It was Wales' third match against England at Twickenham in nine months. The Welsh won the first — and most important — in the pool stage of the Rugby World Cup, lost in the Six Nations and was brushed aside on Sunday after a bright start given to them by prop Rob Evans' converted try in the sixth minute. Wales was without Sam Warburton and France-based players. Flanker Dan Lydiate injured his shoulder during the game and Wales said he will miss the upcoming three-test tour of New Zealand. "I think we brought a tempo and an intensity which we didn't bring here in the Six Nations in that first half," Wales center Jamie Roberts said. "But that 12-point swing at the start of the second half killed us really." England plays three tests against Australia, beginning in Brisbane on June 11.